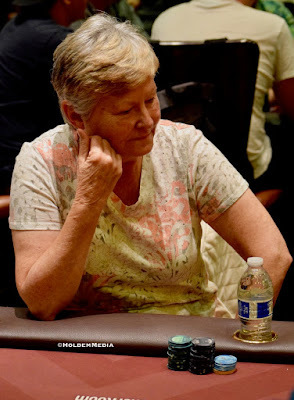 Down to her last 1,600 chips, Brenda Duncan is all in preflop and draws two callers. One of her two opponents bets out and the other folds on the Q-K-x-T board. Duncan shows AK but is far behind her challenger's triple, um, set of Tens. The river is a Jack, Broadway for Duncan, and she scores a walk-off solo shot to get back in the game.